The other day I received a message on Facebook from a friend about someone’s newest way to “recover their child” from Autism. I’d say I receive a Facebook message or email, even sometimes find these sentiments in face to face conversation, at least once per week. So here’s the thing. I’m a nice person. I like to keep the balance, look at things from all sides of the coin, be unbiased about one new treatment or another. But, when it comes to our children, please don’t be the next person trying to tell me how to cure or recover my child with autism, any of the three of them. I’m done playing peacemaker, and finished playing nice. To me, beyond the diagnosis, autism is part of the fabric that makes up this family. It allows one child to ask insistent questions about the world around him and never have enough answers. It allows another to work at least twice as hard as others to fit in with his classmates, even after overcoming all obstacles academically. And it allows one to finally … finally … be finding his voice in a unique and hopeful way at eight years old. Our boys are autistic, it is part of who they are. Autism has colored all their memories of this world, the people they’ve met, and the people they have yet to meet. But it’s part of who they are. I could no less take autism away from Bobby than I could dim his amazing smile. I couldn’t strip autism from the equation with Logan any more than I could stop him from giggling at the world around him. And I couldn’t pull autism from Andy any more than I could take his earnestness and goofy playing voices. Autism is a part of who my children are. The very unique and amazing little men they are becoming. Yes, sometimes autism is like a disease that takes our children’s ability to communicate, to deal with the world around them. But that’s life. Autism is a part of that life. It’s a part of them. Autism is NOT a disease like some cold. And the only treatment scientifically proven to help children diagnosed autistic is not a cure or even a type of recovery – it’s therapy and hard work, and sometimes emotionally scarring for the child to go through. Autism is NOT a death sentence, and does NOT have to mean a child can’t function in society. 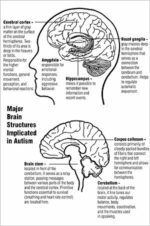 Autism is NOT an evil entity that devours our children, no matter how frustrated and angry the symptoms of autism can sometimes make us as we try to help our children. 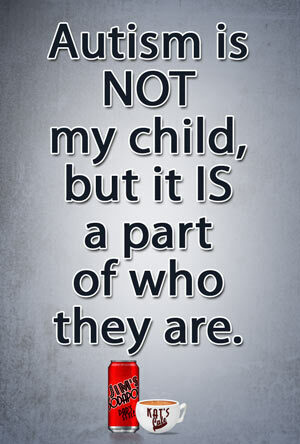 Autism is NOT my child, but it IS a part of who they are. You can’t cure or recover a child who sees their world differently. 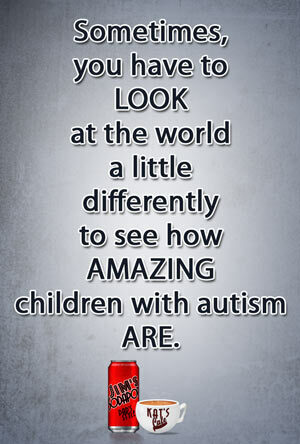 Sometimes, you have to look at the world a little differently to see how amazing children with autism are. Your Turn: I realize not everyone will agree with me about how I view my children’s autism. I’d love to hear from you, regardless of whether you agree with my thoughts or not. I only ask the conversation remains respectful. Note: You can choose to comment using the Triberr commenting system (top) or CommentLuv (scroll down). Katrina &quot;Kat&quot; Moody is the main author of Kat’s Cafe. 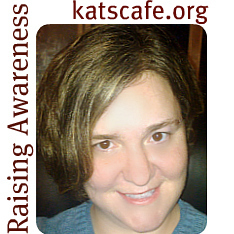 Kat is a wife and mother of three pretty amazing guys who all share a myriad of diagnoses, from Axenfeld Rieger Syndrome, to Epilepsy, Autism, and so much more. When not serving up life at the Cafe, Katrina works as a freelance assistant, copywriter, copyeditor, designer, and a whole lot more.